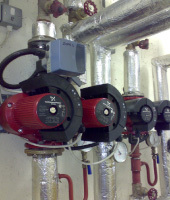 Mussons Heating is your local specialist for commercial boilers and industrial heating. We service, repair and install large commercial heating and hot water systems in shops, churches, hotels, offices, factories, schools, colleges, swimming pools, leisure centres, residential units, and local businesses. We also supply and maintain a wide selection of advanced boiler controls to ensure your commercial heating system delivers reliable high efficiency heating year after year. With an extensive knowledge of boilers, and energy management controls. Mussons Heating are helping you to lower fuel consumption, reduce carbon footprints and save money on your fuel bills. In general terms a domestic boiler is classified as having a gas input up to 70kw. Above 70kw net the installation is considered to be commercial. 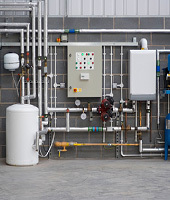 For example if you had a 70kw net boiler this would be deemed to be a domestic appliance but if you had two 40kw boilers connected to the same system, this would then be classified as a commercial installation because the total net input is greater than 70kw. Oil and Gas fired heating. Installations of new warm air heaters and ‘wet’ systems. Replacement warm air heaters, boilers and controls. Annual servicing and general maintenance. 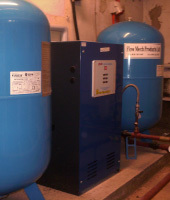 We can help all commercial boiler and heating needs in offices, shops, restaurants, hotels, and all commercial premises, including: gas mains and all gas installations, welded and threaded pipework, underground PE Plastic Fusion welded gas pipe installation, commercial heating and plumbing, boiler servicing and maintenance. 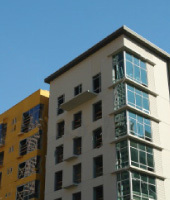 Mussons are specialists in design and installation of any size gas main. 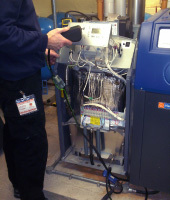 We carry out tightness and strength tests with certification, purges - air to gas / gas to air. We install complete heating systems, plant rooms, heating boilers, radiators, fan convectors, heating pumps, expansion tanks, pressurisation vessels and units. It is important, not only to comply with legal requirements, but having invested in equipment that should serve a good number of years, to remember the importance of regular maintenance. 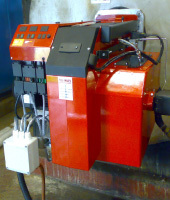 Any gas fired apparatus should have regular maintenance carried out by qualified and certified personnel to ensure the best running conditions and reliability of the plant. The law requires that such gas fired apparatus should be serviced in accordance with the manufacturer’s instructions at least once a year. In some cases, servicing can be more frequent dependant on the environment and the duties imposed on the plant. We recognize that each customer has their own needs. Some prefer to have an informal approach and contact us on a yearly basis for their annual maintenance. Others prefer a more a more comprehensive and contracted arrangement. Either way we are pleased to accommodate and tailor our services accordingly.